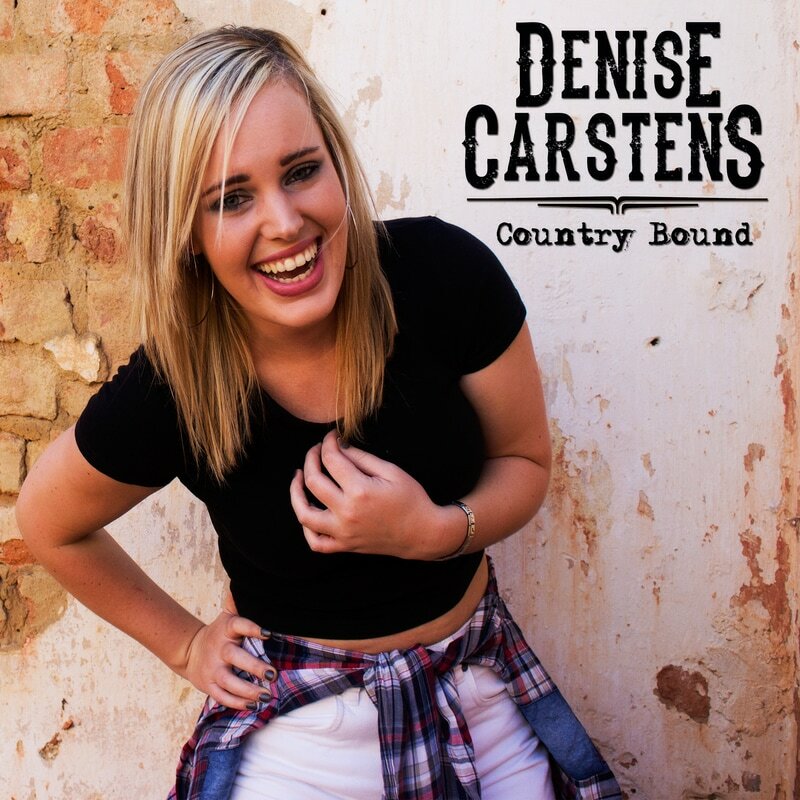 Denise, an energetic and passionate Country Rock Artist, has been in the music industry for the last 8 years. 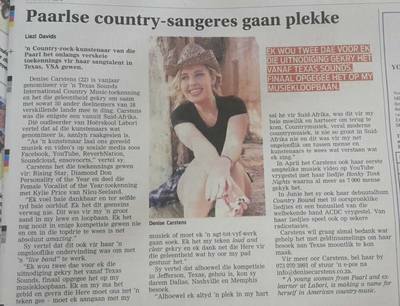 Her first music video of her original song – 'Honky Tonk Nights' (written and produced by Gert Mostert) has been released April 2016 and is now on YouTube to be viewed. ​Her debut album - Country Bound - with 10 original songs was also released in June 2016 and is doing very well. Denise participated in Texas, USA at the yearly Texas Sounds International Country Music Awards. She participated among 50 other contestants from 18 different nations after she was nominated. Denise walked away with the Rising Star Award, Personality of the Year Award as well as the Female Vocalist of the Year Award – giving her a place in the Top 3. Denise was also the first to walk away with 3 awards in one year. She is nominated for a second time and will be in Texas again in November 2018​. Richard Moore Bowden – American Country Rock Musician, Songwriter and guitarist who played for and toured with artist like The Eagles, The Byrds, Linda Ronstadt, Kenny Rogers etc. Mark Carlisle Harrel – He has played many international watched events, incl the Academy Awards and with legends such as The Drifters, The Platters, The Coasters and many more. Shane Mathews – Bassist. He is the 2007 Texas Country Music Hall of Fame Musician of the Year. 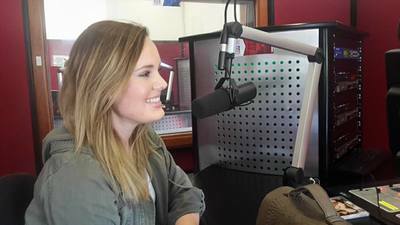 Denise is also currently working along talented singer & songwriter Pierre Rossouw and will release new music as well as music videos during 2018. She is planning on releasing her EP album this year. Denise is also on the committee of the South Africa Country Music Association with Matt Hurter as President. Was part of the ‘Ons Gee Om’ Tour with Pieter Mohr, Rooies and KayCee. Sharing the stage with Matt Hurter, Tommy Oliver and Stephen Bernhardt at the weekly SACMA Country In The Cape shows. 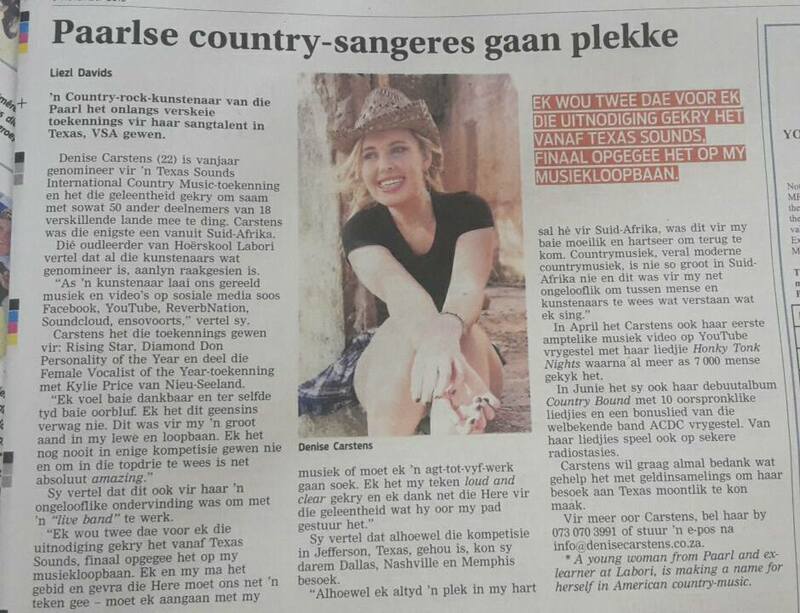 Photo 1: Article in Paarl Post and Network 24. Photo 2: One of the few interviews I did after Texas - Here I am @ Radio KC. ​Who are your musical influences? I’m a BIG BIG Miranda Lambert & Carrie Underwood fan. I’ve been listening to their music and singing along since I could remember. I would definitely say that they were my biggest musical influence through the years. Country artists like Gretchen Wilson, Shania Twain, Trisha Yearwoord and groups like Little Big Town and Joey & Rory are just a few of my favorites and I look up to them a lot. If I have to pick someone other than a country artist I would say Bon Jovi and Neil Diamond. Im also a big ACDC fan. I always dreamt of being like these artists with sold out concerts in Madison Square Garden. This is easy!! Country, Country & a little more Country. And of course some them good old rock n roll oldies! The biggest reason why I love country music so much is because it tells a story. People usually just listen to the beat and melody and not the words. I like showing my feelings and what had happened in my life through music – so I usually pick country songs with similar stories. I think firstly my genre. I do believe my voice gives you that true country feeling. The fact that I bring in a lot of rock n roll with my country songs, gives me a unique style! For me there’s no music like COUNTRY music - it’s something words cannot describe!! I also never forget about my crowd. I’m not just there for the entertainment. I make time to meet and greet my crowd individually as well. It’s important for me as artist to know what my crowd likes and dislikes as well as what they want me to do in the future. What is the best part of being Denise the singer? The best part must be the thrill to perform in front of lots of people who enjoy my music as much as I do. To see people dancing and singing along and forgetting all their troubles makes me happy!! What have been your greatest accomplishments thus far? My greatest accomplishments thus far must be going to Texas and Tennessee and winning those amazing awards BUT also to make it this far through all the let-downs, struggles and criticism. It’s hard to sometimes get up after a let-down but then something like a new, bigger and better show or an amazing fan message cheers you up again and get you right back on that track to follow your dream! It was also such a great feeling to be working on my first album and knowing that it is out and ready for the world makes me the happiest ever. So blessed with all the support I get - whether it's a friend, family member, my producer or even a fan.